She's a cool 87 year-old, with a motorbike and cheeky giggle to match. And she makes candy that literally stops traffic in her home town of Torquay in rural Australia. Meet Maie Zorica, the namesake of Granny Maie's candy - a delightful new cooking app that celebrates the sweet tradition of old-style homemade confectionery – from Toffee Apples and Turkish Delight, to Coconut Ice, Marshmallows, Brittle, Butterscotch and more. With tried and tasted recipes collected from more than 3 generations of family candy-making, it’s the ‘must-have’ app for sweet-tooths of any age or level of cooking skill. Presented in charming vintage style, featuring original cooking equipment, and simple step-by-step instructions in Granny Maie’s own words, it’s liberally sprinkled with ‘Gran-knows-best advice' and hints, along with precious anecdotes from her fascinating confectionery-making life. You’ll also find handy ingredient shopping and equipment compilers and tips on how to create your own candy-making kit. 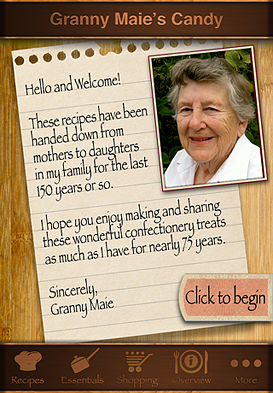 Sample Granny Maie’s Candy with 4 FREE recipes (Plain Toffee, Acid Drops, Turkish Delight and Coconut Ice) included in your free app. 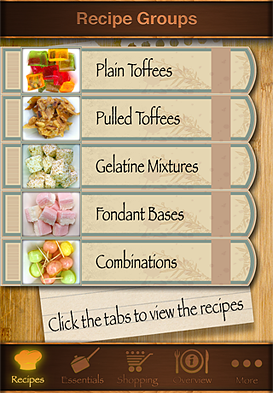 Then browse and buy any (or all) of 15 additional in-app recipes in 5 sections, from Plain and Pulled Toffees, to Fondant and Gelatine-based favourites. 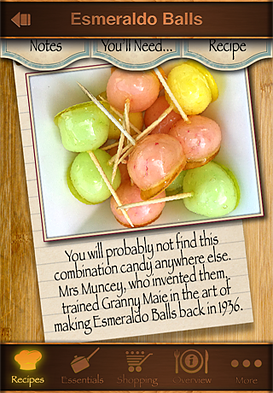 Granny Maie’s Candy app is available for iPhone 4 and 4S, and for 3G/ iPod Touch. As stated in the app, Granny Maie's especially made-for-purpose toffee-cutters are an excellent tool for cutting toffees and marking fudges. We have a PDF with instructions on how to make your own confectionery marking/cutting tool, so please email us your details to so we can send it to you. Note: Your confidential information is very important to us and will not be shared with any third party for any reason whatsoever. We optimised code and graphics for better performance. There’s a new and improved interface with brighter headings and clearer navigation. Most recipes have been rewritten in parts to simplify the instructions and add more useful information. Granny Maie double-checked and cooked all the recipes in her kitchen just to be sure. Twice. The thermometer simulation is more accessible in the ‘Overview’ Section. Some of you may have missed it the first time. There is more of Granny Maie’s special brand of humour included throughout the app. We fixed some bugs with email, iMessage, Facebook and Twitter in the ‘More’ Section, so share your stash! Most, if not all, of the spelling errors have been found and fixed after extensive quadruple checking and a 6-week sugar-free diet. No coders or artists were harmed during this process, however any leftover homemade candy donations will be gratefully accepted.